Is a Medical Doctor, MD, performing your procedure and is he Board Certified? It is important to know you have access to a Board Certified MD to answer any questions you may have before, during or after the procedure. They are the most qualified to help you with your total health. The doctor should have a permanent office so you know they are established in your area and dependable. Know who you are consulting with. Make sure you are speaking with a medical doctor during your consultation not just a sales person or representative. Amniotic Derived Stem Cells – These are stem cells obtained from the amniotic fluid of babies but are foreign cells to the patient receiving them. This is a common source of stem cell therapy currently spreading across the country. Many pharmaceutical companies are now harvesting placentas to obtain the amniotic tissue in order to package it and sell the tissue as a stem cell product. These companies have drug reps trying to state that the stem cell therapy results obtained in European research is the same as their product. However, this is not the truth. The results obtained in European research were obtained only from fat and bone derived stem cells, not amniotic stem cells. In fact, amniotic tissue could not maintain viable tissue in the body. All stem cells are called privileged cells. That means in their primitive state they do not express any surface markers to identify what they are. This privileged state allows them not to be destroyed by your immune system when injected into the body. When the stem cells mature into the tissue they will become whether it is bone, muscle, cartilage, or endocrine organ, they will finally express surface markers to state what they are and where they come from. Research has shown that once this maturity occurs, the stem cells are no longer in a privileged state and if they did not originate from your body, as in amniotic derived stem cells your immune system will destroy the tissue as a foreign invader. Sadly, research has proven that amniotic derived stem cells have no replicating ability to restore a person because your immune system will reject them when they become an adult cell. This fact is common knowledge. Take for instance, in order to receive a kidney transplant it must first be closely matched. Even after that, the kidney would be rejected by the recipient’s immune system unless the patient received lifelong anti-rejection medications to prevent their immune system from destroying the foreign kidney. This is the same outcome with foreign derived stem cells such as amniotic stem cells. Hence, amniotic derived stem cells have no replicating healing properties as do fat and bone derived stem cells. However, all stem cells no matter where they come from create cytokines or growth hormones. These growth hormones do induce native tissues to divide more rapidly creating some healing. Finally, amniotic stem cells are foreign so they can’t replicate but only have mild healing properties via the growth hormone effect. Fat and bone derived stem cells are the only cells that have replicating abilities and the growth hormone effect. So in order to receive the results seen in European research, a patient must use either fat or bone derived stem cells not amniotic derived stem cells. Platelet Rich Plasma (PRP) – PRP is derived from blood and is not actually stem cells. Often clinics will sell PRP as a stem cell procedure, but it actually is not stem cell. However, they do attract the natural circulating stem cells into an area. PRP can help accelerate healing by increasing the number of naturally circulating stem cells into an area, but the affect is mild at best. It can be used to treat minor injuries such as a tennis elbow. The patient should know if the provider is taking blood to obtain “stem cells”. If so, then the treatment is actually NOT a stem cell treatment it is just a PRP treatment. However, PRP can be added to stem cell treatments in certain instances to cause the stem cells to divide more rapidly and stay in the location injected for a longer period of time to enhance the chances of the actual stem cells repairing the injured site. Wharton’s Jelly (umbilical cord) – Wharton’s Jelly is also derived from amniotic tissue but has very few stem cells in it . Wharton’s Jelly is concentrated cytokines. Cytokines act like a growth hormone so it will cause some native tissue to grow more rapidly causing some repair. Wharton’s Jelly is about the same as getting a growth hormone shot in a local area. Its effect is only short lived and requires multiple treatments to create a moderate benefit. 4/5 Bone/Fat Derived Stem Cells – Stem Cells derived from bone and fat are actually stem cells. Both have replicating abilities. Both cell types can create cytokines. Both cell types are not rejected by the immune system since they come from the patient directly. Research has been back and forth on which cell type is superior at becoming other tissues. On looking at numerous research projects, bone marrow is slightly more effective at becoming bone. Due to its mild predisposition to becoming bone, it can become bone in soft tissues on rare occasions. Fat Derived Stem Cells are more primitive cells in our body, therefore they can become any cell type to repair any particular organ or tissue. This fact makes them a better choice for any treatment chosen. They are also less likely to become bone in soft tissues. There have been mixed results in research on which of them grows more quickly cell to cell. Be aware that most of the results showing bone derived stem cells to grow more quickly were paid for by the bone biopsy kit company creating a bias in their favor. Many international independent research teams have shown fat derived stem cells to grow more rapidly. In either case, all research has shown that fat derived stem cells are at least 500 times more plentiful than bone derived stem cells. Generally speaking, fat derived stem cells can deliver at least 500 times more stem cells to a treatment area than bone derived stem cells per milliliter making fat derived stem cells more efficient. Conclusion : Although all products called stem cells have some benefits, Fat Derived Stem Cells are the most effective stem cell choice with the least chance of side effects and rejection. Embryonic Stem Cells are illegal and have been shown to cause tumors since they are not from the patient It is also immoral to harvest stem cells from aborted fetal tissue. Amniotic tissue from the placenta of a baby is used to harvest heterogeneous mesynchymal stem cells to create products called a-cell and Wharton’s Jelly. Most companies that provide these products state they have live stem cells, however most on independent verification have very few surviving cells that make it to the doctor let alone the patient. The stem cells have to be harvested during a baby’s delivery and then kept alive at the hospital in order to be packaged for transport to a processing center typically hundreds of miles away. Then purified feed to stay alive and frozen for storage. Once sold, it is sent to the doctor’s office to be kept until needed once again creating a lag time decreasing the chance of the fragile stem cells staying alive. If by some miracle you get viable stem cells, the companies say they deliver about 1million stem cells per ml. Amniotic Tissue Stem Cells do proliferate faster than bone or fat derived stem cells. Amniotic Tissue Stem Cells might proliferate at a faster rate, but every cell that matures expresses foreign human leukocyte antigen, which causes it to be destroyed making the proliferation rate inconsequential. Amniotic tissue, just like all stem cells, can promote tumor suppressing genes. This temporarily suppresses cancer. However, once the stem cells have matured in to the adult form they lose this ability and the foreign cells now can cause a higher risk of tumor creation seeing it is not from the patient. Telomere length is longer but plays no role since the immune system destroys them once differentiated. 3 Fat Derived Stem Cells are from the patient’s own body. They are called homologous autologous mesynchymal stem cells. They are all alive seeing it only takes 2 hours to go from removing the fat and processing the stem cells out of the fat and waking the stem cells up from their hibernation state to reinject them into the treatment area. One ml of fat will yield at least 1 million stem cells. Since most people have an abundance of fat, very large numbers of stem cells can be harvested for use typically 60 million cells per treatment area. This is much larger a number than amniotic derived treatments deliver. Fat derived stem cells are naturally kept in a hibernation state in the fat, keeping them young. The reason children heal faster than elderly people is the number of circulating activated stem cells in use in the blood stream is higher by percentage compared to the elderly. So elderly people can use their own stem cells to heal them at an extremely quick rate. Fat Derived Stem Cells produce a large robust range of specific cytokines to aid in healing. Fat Derived Stem Cells have the ability to differentiate in to any cell type such as nervous system cells, liver, heart, pancreas, osteogenic, chondrogenic, and schwann cells. Fat Derived Stem Cells have been shown to regrow the heart after heart attack. Fat Derived Stem Cells have been shown to reverse cancer. Via its immune –modulating activity and more importantly its ability to make cancer killing cells to hunt cancers. destroyed by the immune system when they mature. Fat Derived Stem Cells can yield tens of millions more cells per treatment area. This makes Fat Derived Stem Cells the most powerful and useful option for repairing the body since they are not rejected after they mature. Are Stem Cells FDA approved? NO. No stem cells are FDA approved. All stem cell treatments in the United States are considered experimental. Any center performing stem cell treatments must fully comply with the FDA Guidelines for performing experimental treatments mentioned in section 361 HCT/P. As long as this guideline is met, then stem cell therapy can legally be performed. Fat derived stem cell therapy at Next Generation Stem Cell Clinic fully meets the FDA guidelines. Since The FDA has not approved stem cell therapy for mainstream use, insurances are not required to pay for it. How do we deliver stem cells ? It depends on the disease process. If it is a joint injection, Ultrasound can be performed to identify the specific location of the joint. If the treatment is for COPD, we nebulize the stem cells in with albuterol. If it is a Parkinson’s treatment, we do a spinal tap injection. If treatment is for Lupus, IV infusion is performed to administer the stem cells. A detailed plan of action will be designed to exactly fit your treatment needs. What is the experience of your stem cell provider? 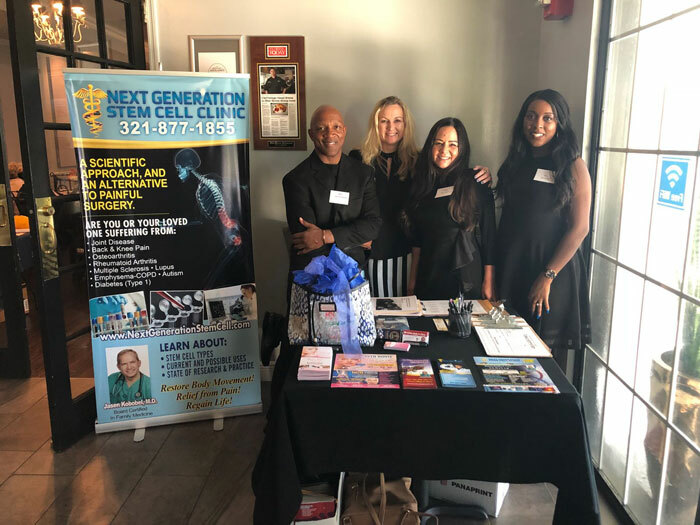 Next Generation Stem Cell Clinic was the first stem cell clinic in Brevard County. Dr. Jasen Kobobel has been performing stem cell therapy for 5 years . That’s longer than any other doctor in Brevard County. He provides full comprehensive care of all his patients. Our success rate matches the success rate from European research. Make sure you have a Board Certified, experienced Medical Physician performing your procedure. Fat Derived Stem Cells are the most effective viable stem cells that can actually replicate and not be destroyed by the immune system. Fat Derived Stem Cells are from your own body and pose no risk to the patient since they are their own healing cells activated to do what they were programmed to do but now in vast numbers. Fat Derived Stem Cells at Next Generation Stem Cell fully meet the FDA Guidelines to perform stem cell treatments. Next Generation Stem Cell Clinic has a comprehensive delivery system designed to exactly treat your health needs. Jasen Kobobel is the most experienced, knowledgeable and dedicated stem cell doctor on the Space Coast. Time is of the essence! The longer you wait to treat your condition, the more it will worsen. Call 321-877-1855 to make an appointment with Dr. Kobobel TODAY to start your journey to a stronger, healthier, happier you!